We have almost completed the first round of visits to study lakes. Our ever-expanding list of lakes makes this no mean task, as our list has grown from 95 territories in 2008 to 123 this year. Kudos to the field staff of Joel, Eric, Chris, and Linda (whose photo appears above), who have worked hard to visit lakes and ID loons from leg bands — and also Al on West Horsehead and Pat on Silver Lake, who have e-mailed with data from their lakes. Of 162 banded loons on territories as of late 2014, 141 (or 87%) have reclaimed those territories this spring. Among 21 missing territory holders from 2014, 4 have been resighted in 2015, but were apparently evicted from their territories early this year. Thus, the minimum survival rate from 2014 to 2015 for territory holders is about 90%. This figure agrees closely with survival rates calculated from Wisconsin and elsewhere within the breeding range. Sky-high return and survival rates for our population highlight a simple pattern in the life history of common loons. 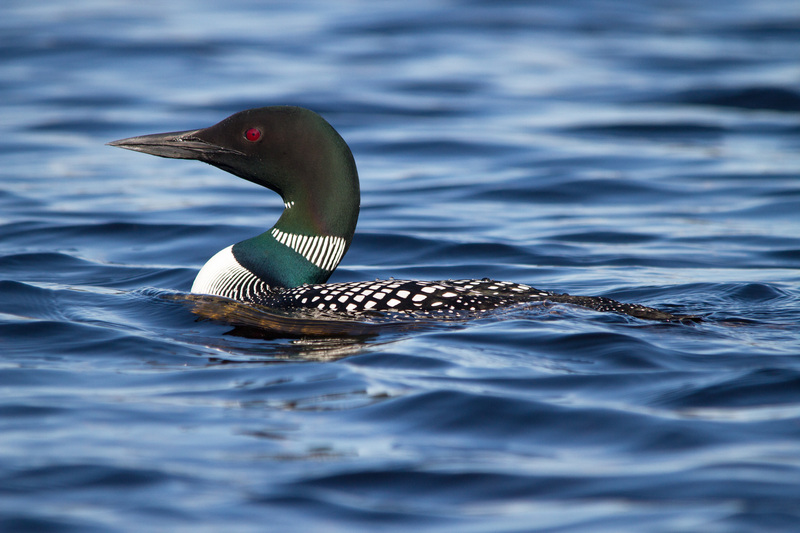 In ecological terms, loons are “K-selected”. That is, they are long-lived, take several years to reach sexual maturity, produce few offspring during their lives, and invest heavily in parental care for the few offspring they do produce. Loons are not explosive reproducers that “shot-gun” many offspring out into an uncaring environment in hopes that a few survive. Rather, they work hard to maintain ownership of their breeding territory, eke out one or two chicks a year (in a good year! ), and defend their chicks vigorously against all comers! Previous Article Gabby’s Paper on Chick Defense Accepted for Publication!